Introduction to Computation and Modeling for Differential Equations, Second Edition features the essential principles and applications of problem solving across disciplines such as engineering, physics, and chemistry. 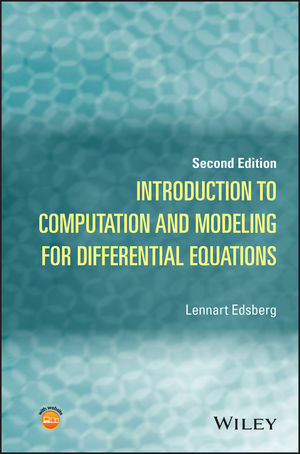 The Second Edition integrates the science of solving differential equations with mathematical, numerical, and programming tools, specifically with methods involving ordinary differential equations; numerical methods for initial value problems (IVPs); numerical methods for boundary value problems (BVPs); partial differential equations (PDEs); numerical methods for parabolic, elliptic, and hyperbolic PDEs; mathematical modeling with differential equations; numerical solutions; and finite difference and finite element methods. Introduction to Computation and Modeling for Differential Equations, Second Edition is a useful textbook for upper-undergraduate and graduate-level courses in scientific computing, differential equations, ordinary differential equations, partial differential equations, and numerical methods. The book is also an excellent self-study guide for mathematics, science, computer science, physics, and engineering students, as well as an excellent reference for practitioners and consultants who use differential equations and numerical methods in everyday situations. Lennart Edsberg, PhD, is Associate Professor in the Department of Numerical Analysis and Computing Science (NADA) in the School of Computer Science and Communication at KTH - The Royal Institute of Technology in Stockholm, Sweden, where he has also been Director of the International Master Program in Scientific Computing since 1996. Dr. Edsberg has over thirty years of academic experience and is the author of over twenty journal articles in the areas of numerical methods and differential equations.